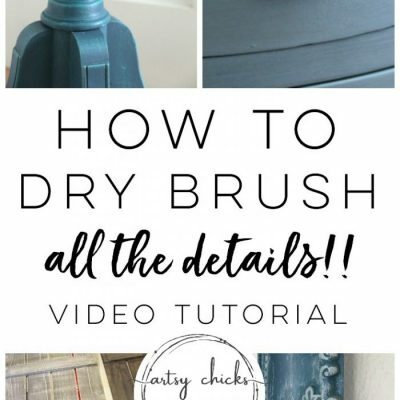 I am SO excited to share this super fun project with you all today!!! I mean really excited. It might just be my all time favorite painting/graphics project to date. For real. 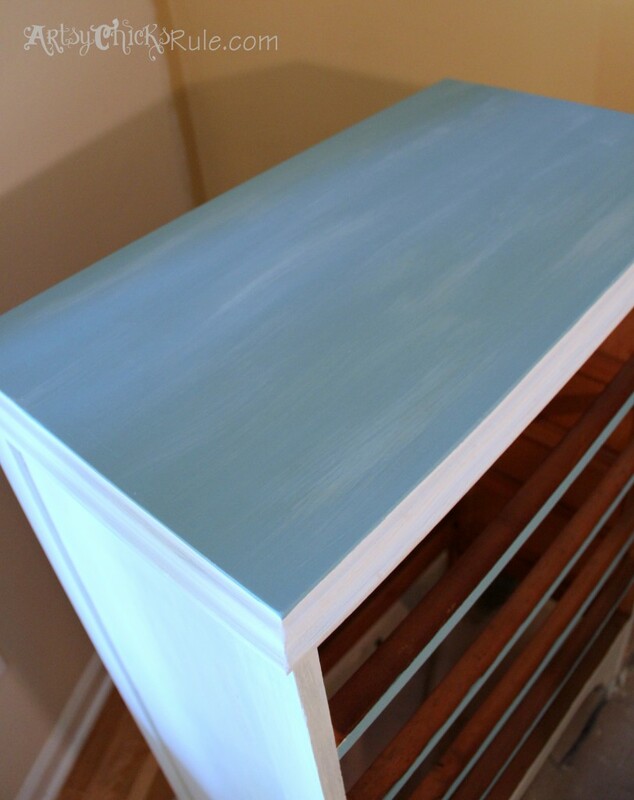 Coastal themed chest, Chalk Painted & BLUE? All things I adore. If you follow me on Instagram (I’m addicted to Instagram…I love it!) you’ve already seen this in action and little snippets of the finished piece before now. I post pictures there as I go long before they get here. Plus fun, random things too. 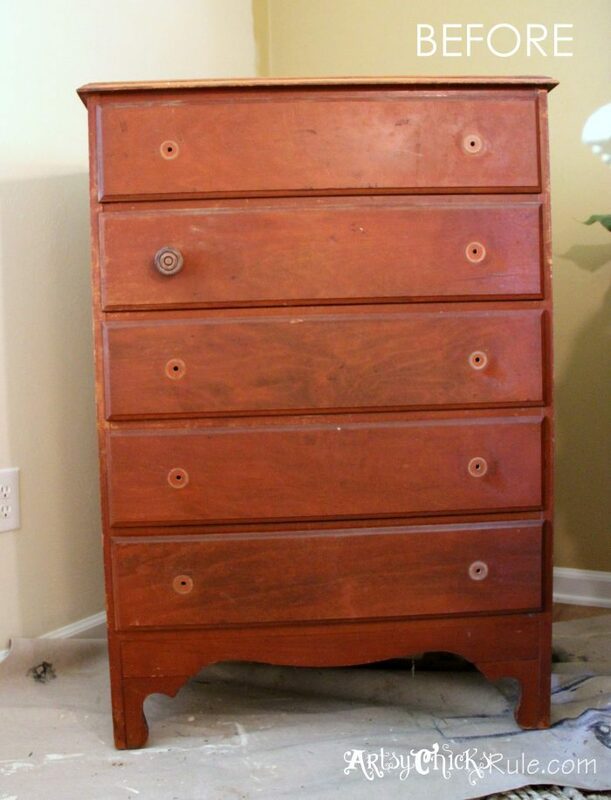 I picked up this dresser at the thrift store for $50. More than I usually pay but it was made well and in good shape. 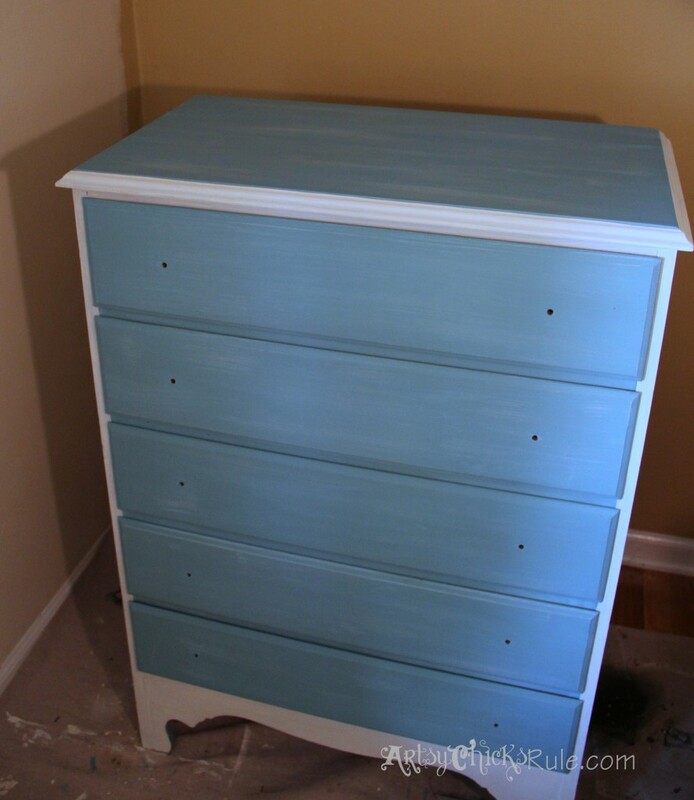 And I’d been wanting a tall chest type dresser for awhile to do something like this on…so I took it home with me. I created a new custom graphic on my computer about 3-4 months ago…just waiting for the right piece to use it on. I had originally planned to take this up to the shop once complete but um, no, it is still with me. I couldn’t part with it. The “before” is shown above…and yes, it did come with all the knobs attached but I had already removed them when I remembered I had forgotten to take a “before” pic. 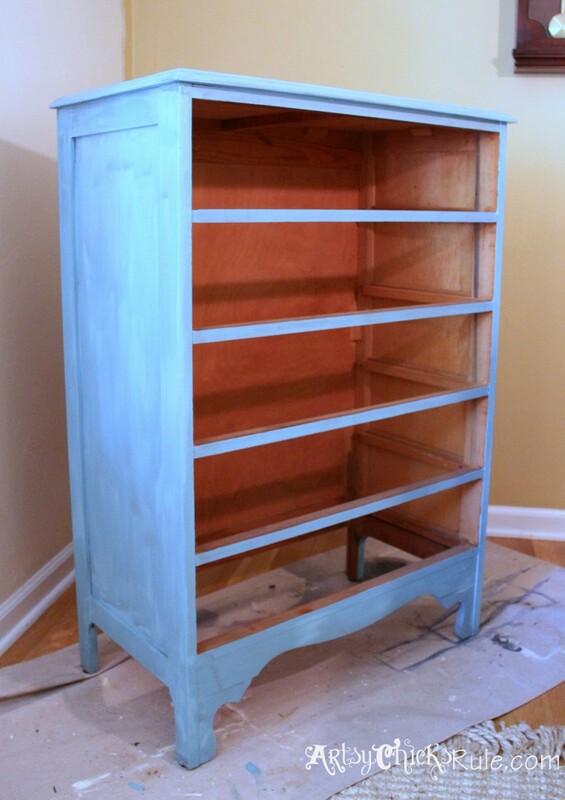 I painted the Provence underneath because I wanted it to show through when I distressed it. 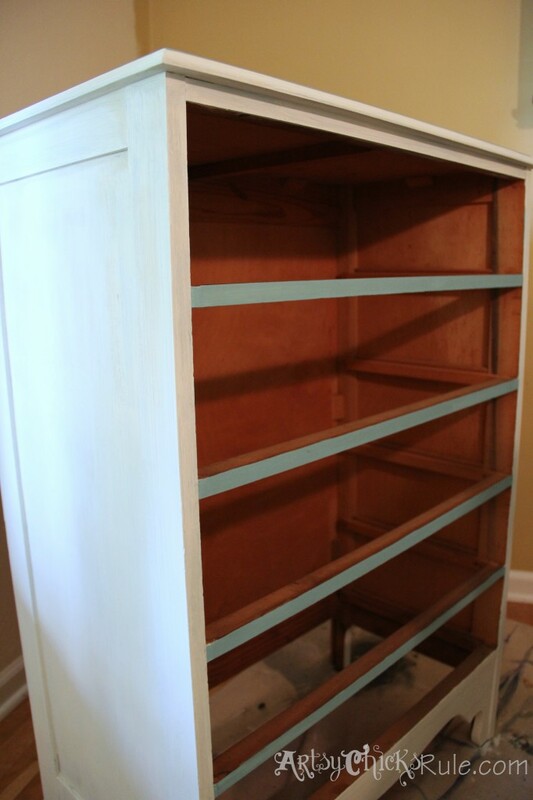 I did only one coat of the Old White/Pure White blend on top so the Provence color would show through a little bit all over. 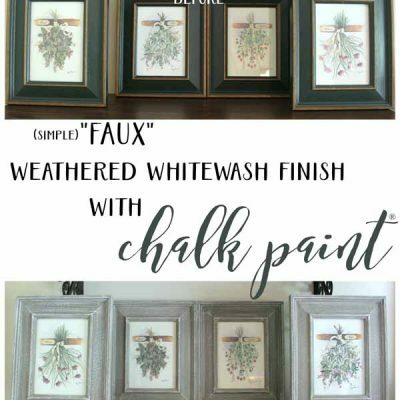 To dry brush, I used a blend of Provence, the White blend I mixed up & some water to give dimension and a more weathered appearance. I went back a few times and kept adding until I had it how I wanted it. Multi step process. After that dried I started putting on the graphic with the help of my projector. Want to see ALL of my favorite transfer methods?? You can find them all in one post, here. You can see the dry brushing I did better in this photo. I used a white watercolor pencil to draw in the graphic since I was going to be painting the letters white. 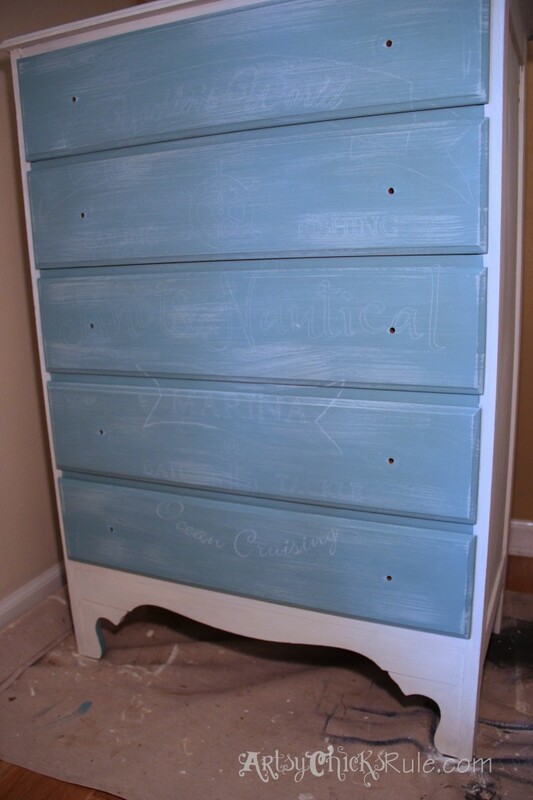 I then used the same white blend of Chalk Paint I used on the rest of the piece to paint in the wording. Looks like the paint color is a mess from sanding but it will be okay. And now…see the blue peeking through the white on the sides? I finished it with one coat of Clear Wax. 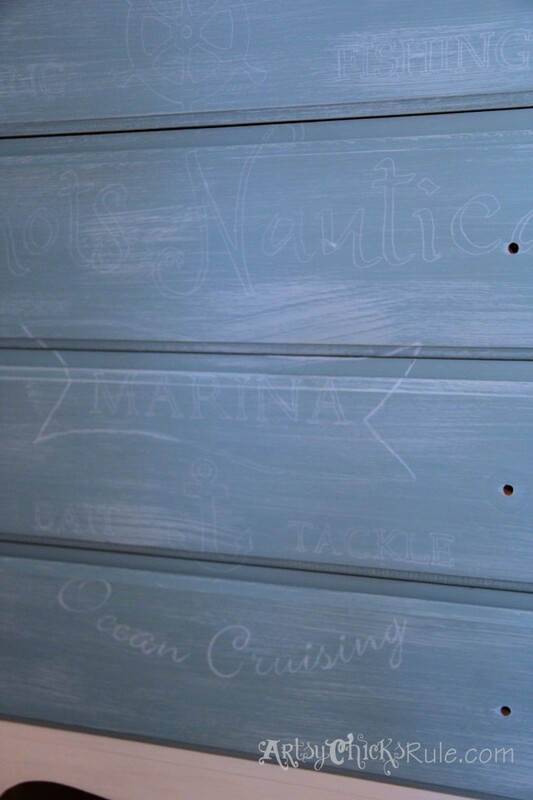 Close up of the distressing, graphics and dry brush. And yes, those are different knobs. (in case you didn’t notice) I wanted crystal style but didn’t have enough of one type….so I mixed it up a bit. I was thinking I would do it for picture taking purposes only and change them out to match later…..but I actually like the look of the mixed knobs now. I believe they will stay. 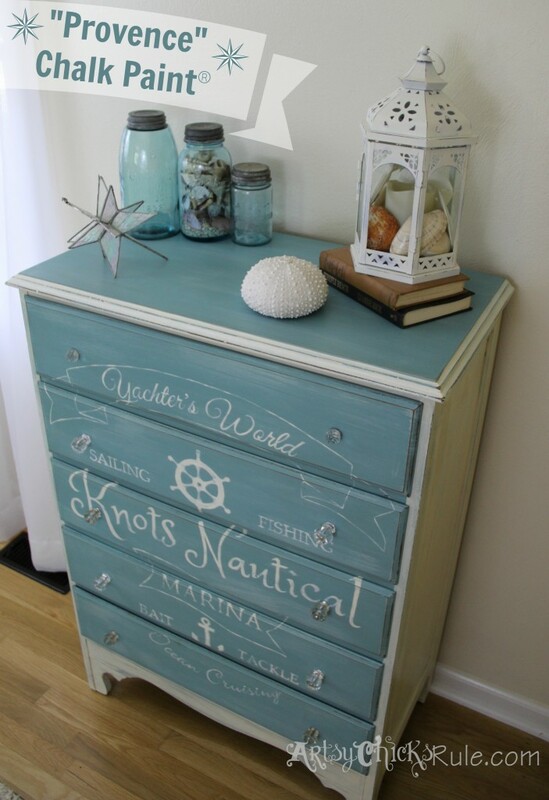 A little nautical styling on my “brand new” coastal themed chest…. 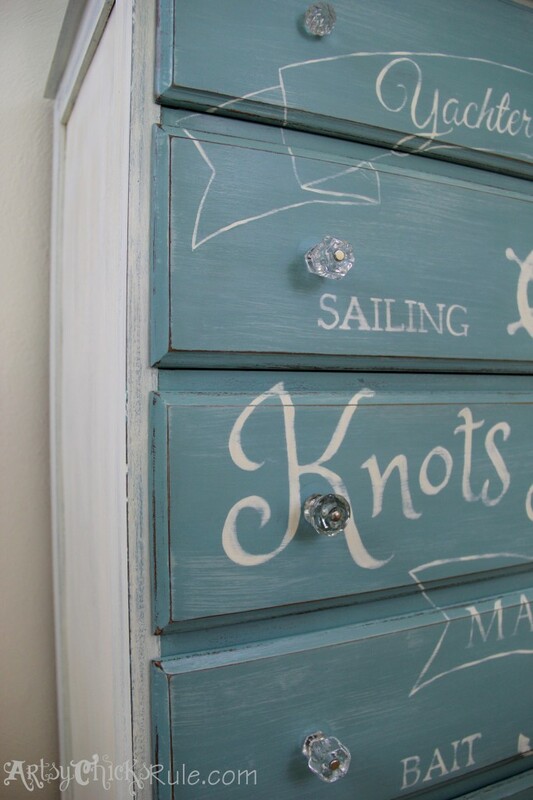 I really do like the knobs mismatched…it’s a bit whimsical & eclectic to me and I like that. So what do you think? You like? How about the mismatched knobs? Yes or no? 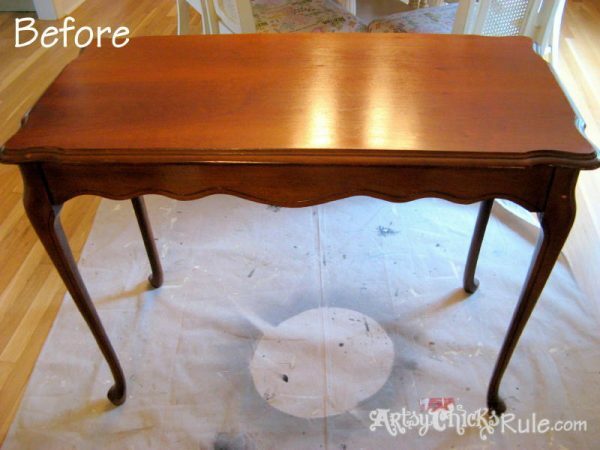 Be sure to check in next, when I share what I did with this old table! I love this! And I want to do this! Love the painting and distresing techniques. Where/how did you get the graphic? I LOVE your knobs and don’t mind at all that they’re mismatched. ;) In fact, they make it way cuter than if they were all matching. The whole piece rocks!!! 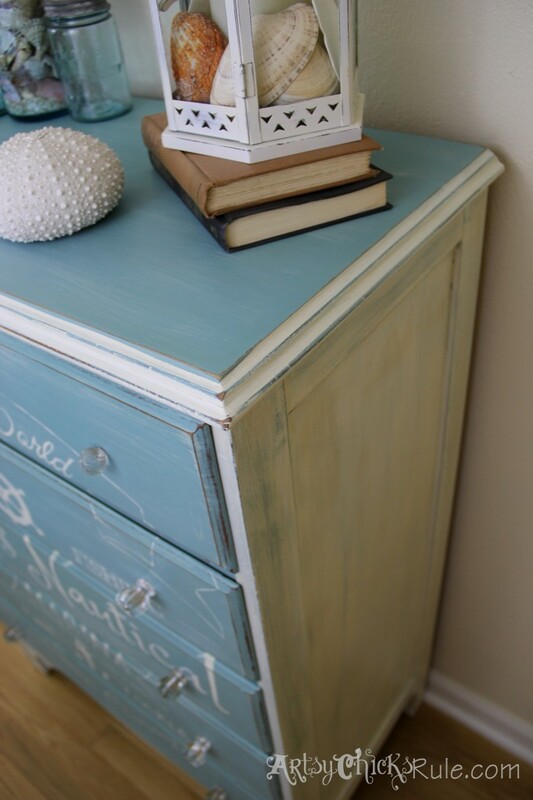 I love this little dresser. Having a projector to do graphics would be great. 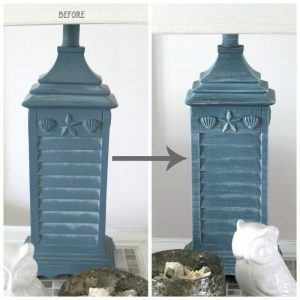 Have you always used it and do you like it better than a stencil? 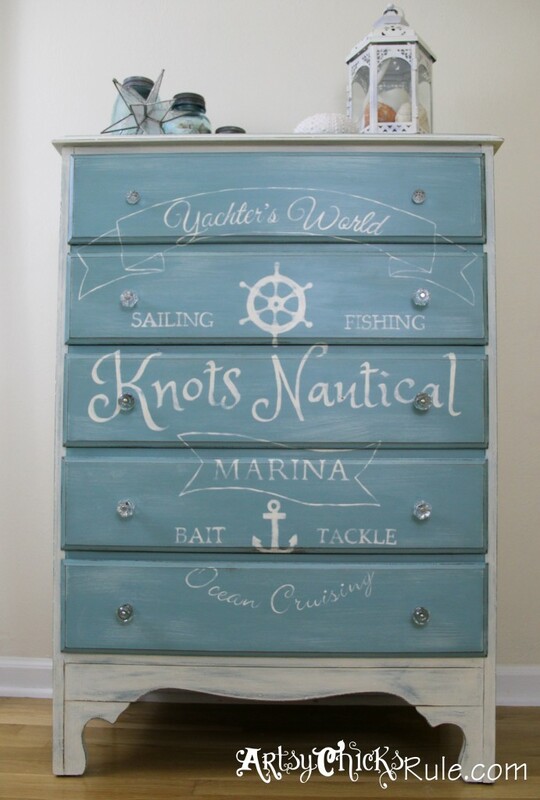 I would keep this dresser too!!!! Thanks for sharing! No, I don’t use stencils much. I do mostly graphics (from The Graphics Fairy or ones I create on the computer) and transfer with the projector, or by coloring the back of the graphic and tracing it onto the piece. Sometimes I will hand draw the letters in. (though not often! ;) ) And yes, it’s so funny…it really was meant to go to the shop but the more I worked on it, the more I knew it was going to stay right here! 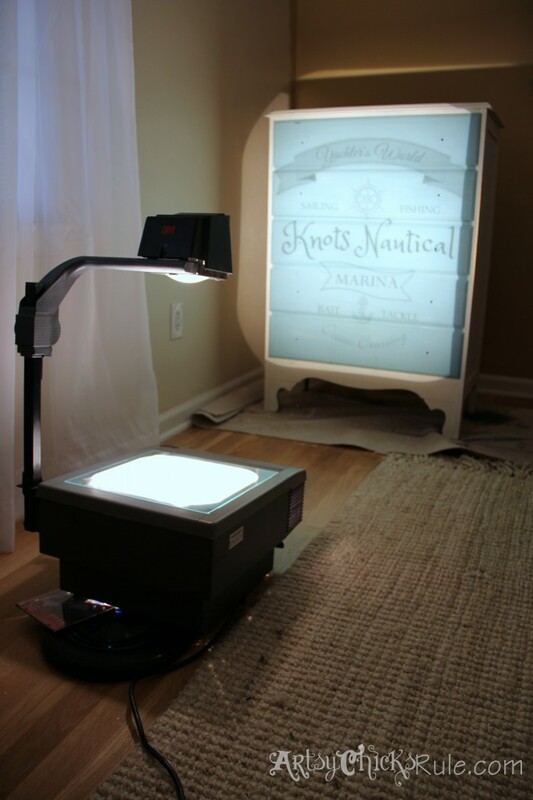 If I were hunting for a projector like yours….where would I find one like that? I have seen a few small kinds at joanns but reluctant to buy cuz I didn’t know if they were worth the $110+ Yes Graphic Fairy has beautiful graphics….I need to figure out the whole download and sizing thing~ I’m sure it’s a gazillion times better than stencils. SO beautiful, Nancy! Love it! And you’re right– the mismatched knobs really suit it! Hope you’re having a great week, friend! LOVE it Nancy!! So pretty (or should I say handsome?!). Your technique is awesome and added such character and sense of age and history to it. Wonderful!! 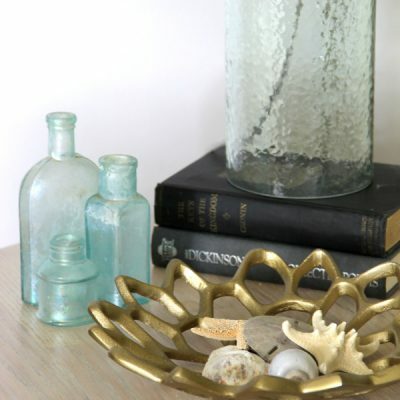 I love crystal knobs and found a place to get them that are reproductions and aged. I use them on everything almost. If you didn’t say it I wouldn’t know the knobs were mismatched. The whole thing is just fantastic. omgoodness how cute is this! I love it. Lovely! 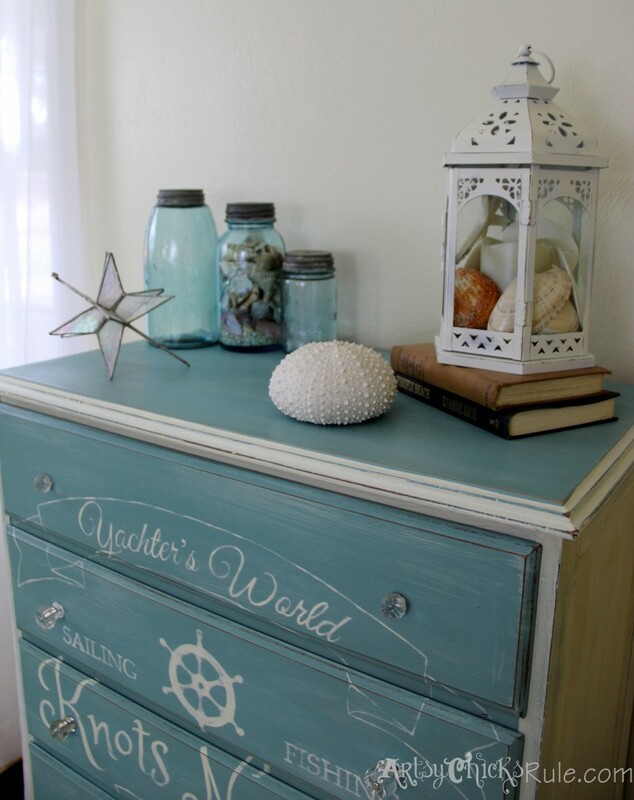 I love the coastal theme of your dresser and also the color. Our school is loaded with old overhead projectors that aren’t being used. I just may have to take mine home for a weekend at some point for a project like yours. Good find on the projector! Thanks so much for the shares! This is just gorgeous! 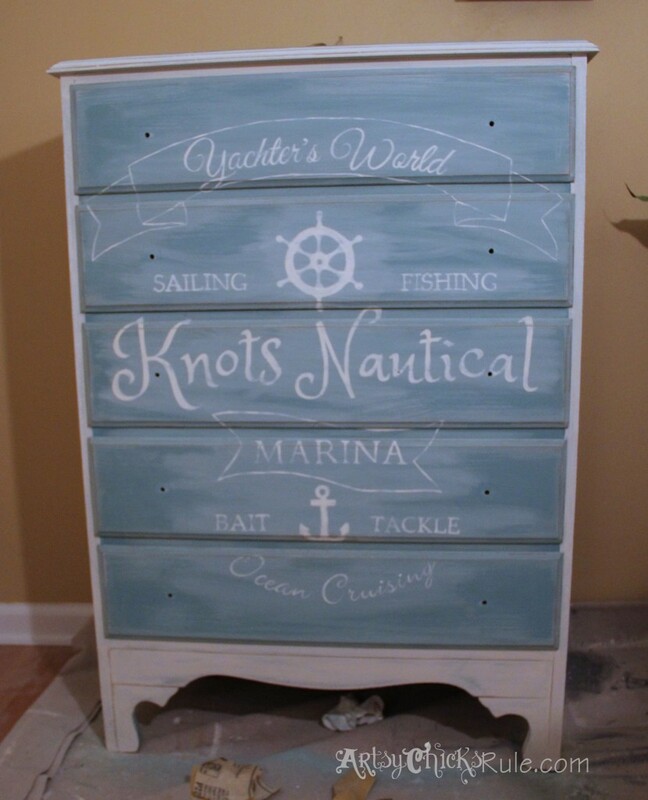 It turned out amazing and agree with everyone else on the mismatched knobs.. 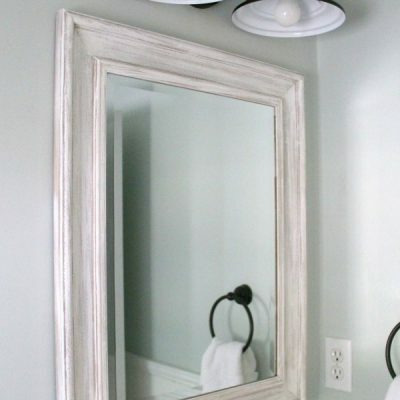 Saw this DIY on Pintrest it really is amazing thanks for sharing it and the steps to create it. I love the dresser! Great job! Thanks so much Marie :) It’s one of my favorites! And my most complex (not that it’s all that complex ;) ) graphics I’ve designed myself. A fun one to do, for sure! This is the most beautiful painted piece I have EVER seen. Be still my heart…you are incredibly talented and you should be extremely proud of yourself! BEAUTIFUL!!! Have a great day! Pamie G.
OH thank you so much!! :) It is one of my favorite pieces. I worked on the graphic for awhile to get it just right and had originally planned to sell it…but then couldn’t part with it! Thanks so much! I am actually putting together an entire ebook of graphics/printables I’ve created for the blog, including brand new ones never featured on the blog, that I hope will be ready very soon. 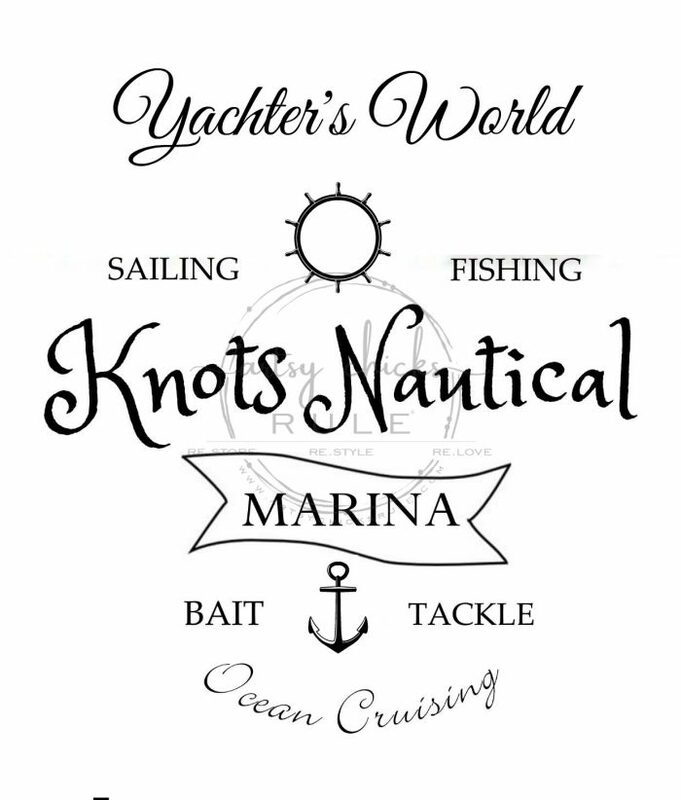 I am including other “knots nautical” items as well. I can keep your email handy and let you know when it’s ready. Thank you! I went ahead with some other graphics, but would still love to use yours when it is ready. Thanks! I’ll be sharing it here on the blog when it’s ready also. Nancy, This dreser has my name all over it! I tracked it down from Meegan Makes when she featured it on her Blue Monday! Beautiful! I’m bummed that I gave my projector away before I moved here:( I see how useful it is. 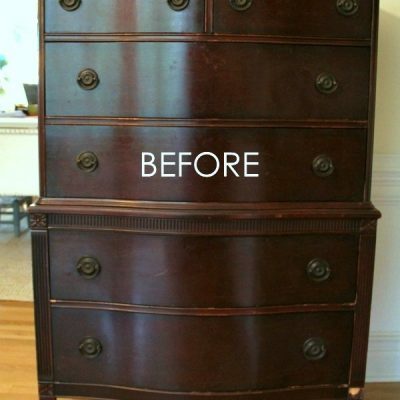 Your dresser will be on my mind when I finish one for our bedroom makeover! Thank you Wendi! :) Oh, you need to get another! ;) I got this one for about $40 off of CL. It has definitely been very handy!! 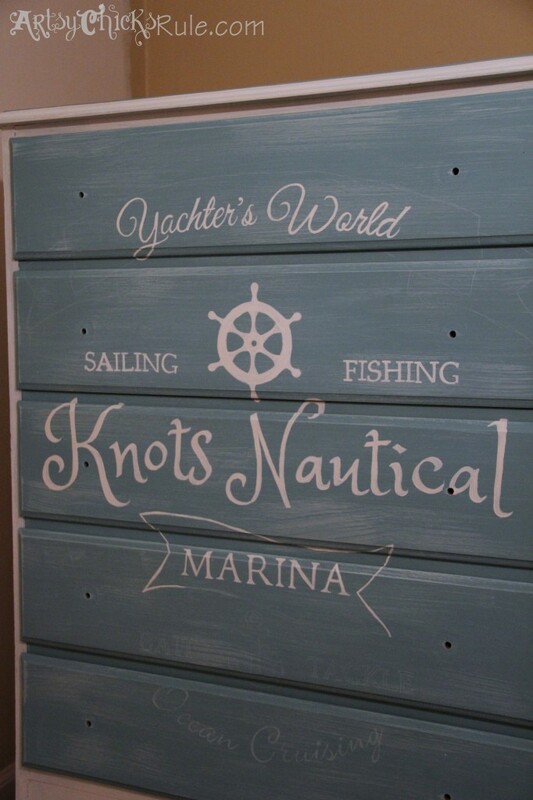 What a fun project, I love the color you chose. Thanks for the great tutorial! This is gorgeous. I love how you use the projector. Really fabulous, Nancy! 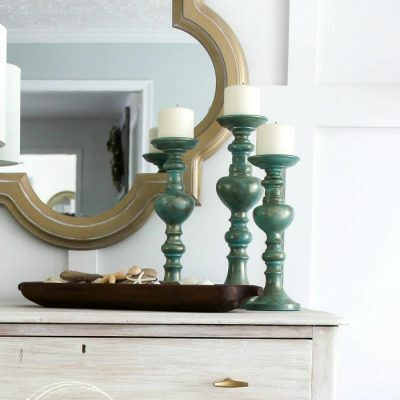 I like the look of mismatched knobs and the paint looks fantastic! It is fantastic. The knobs are great. I wouldn’t be able to part with it either. I LOVE this! And after a quick look around your blog I pretty much love everything you do! Not sure how I haven’t found your blog before today, but I’m so glad I did! You have so many cute ideas Nancy!! I love the graphic you used, it’s so stinking cute! Love it! 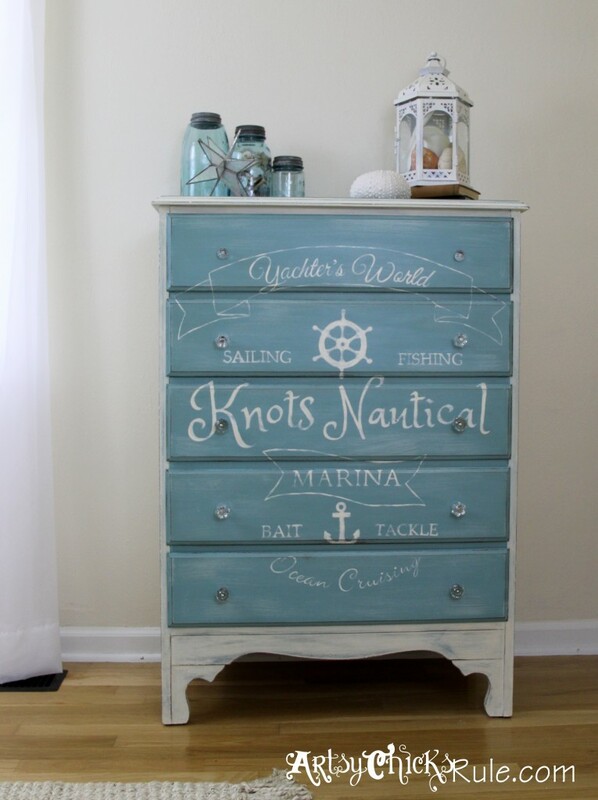 Love the nautical dresser. I know the post is older. 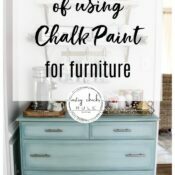 I was wondering if you painted the inside of the drawers and what color?